From “The Beauty of the Feast” article in the August 2017 issue. Place cream and half-and-half in a heavy-bottomed saucepan. Bring to a simmer over low heat. Stir cup sugar and vanilla extract into cream. Whisk remaining sugar and yolks in a medium bowl until lemony yellow. Add cup of warm cream to yolks and whisk to combine. Add yolk mixture back into cream and return to heat. Cook the mixture, stirring constantly, until it coats the back of a spoon. Remove from heat immediately and pour into a bowl. Cover and chill until very cold. 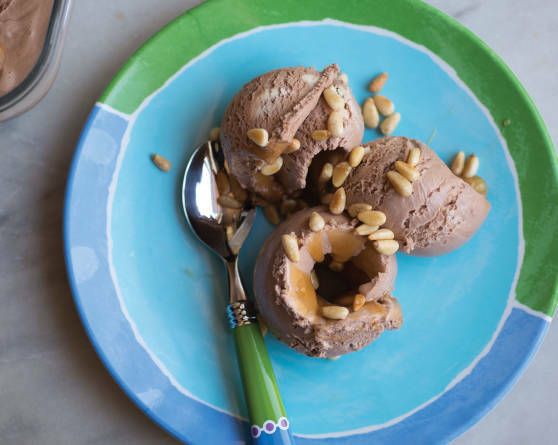 Once ice cream has reached appropriate texture, spread it onto a 9-by-13-by-2-inch baking dish, cover, and freeze. Pour cooled caramel sauce over ice cream. Using a large ice cream scoop, make long scoops into the ice cream, allowing the caramel to curl into the mixture. Place scoops in a freezer container. Freeze. Serve topped with toasted pine nuts. Place sugar and water in a heavy saucepan and stir to moisten sugar. Bring to a boil, then cook until mixture reaches a deep golden brown color, about 10 minutes. Use a pastry brush dipped in cold water to keep the sides of the pan free of crystallized sugar. Remove from heat and carefully stir in cream. Use a long-handled wooden spoon, as mixture will bubble up. Return to medium heat and cook until caramel becomes smooth. Stir in salt. Allow to cool, stir in chile, cover, and refrigerate for up to two weeks.